OpenSprinkler Firmware 1.8.1 is available for download in GitHub, go for it! If you haven’t updated firmware before, here are the Firmware Update Instructions. Custom station names: each station can have a custom name up to 12 letters long. Per-station master operation control: each station can individually activate the master station. Run-once program: similar to the manual override feature on some sprinkler timers. Station delay time, and master on/off adjusted time: fine tune station turn-on and turn-off time. Water level/percentage: globally scales water time up and down based on local weather conditions. Automatically reconnect: improves reliability on unreliable networks. Support for RTC and automatic RTC detection: keeps time running even when power or network is lost. Full range of time zones: living in Nepal? No problem. Program now has an ‘enable’ flag which allows you to enable or disable each program individually. Improved Graphical Preview feature, which shows each station’s name and scheduled on/off time. So this is another major upgrade since Firmware 1.6. So what happened to Firmware 1.7? Well, that was a quick update for the preparation of OpenSprinkler 1.4 orders: except for added support of RTC, it didn’t have any major changes. So I had to number this one 1.8 to distinguish it from the previous version. Also taking a suggestion from the Forum, I’ve starting using minor revision numbers (1.8.0, 1.8.1 etc.) to keep track of changes in between major releases. This way you can easily find out whether your version is up to date. I’ve also made a video tutorial (above) for those who want a video guide on how to use this firmware. I ended up having to switch between different ways of recording, so the audio quality is not consistent. Sorry about that, and enjoy the video! It’s my first Raspberry Pi (Raspi)! I know I should have got it much earlier, but I was not fond of being put on a waitlist. Apparently I should have kept better track of it: I was checking some stuff on Newark.com the other day and accidentally noticed that Raspi is in stock. Without any hesitation I immediately placed an order. Three days later, it’s here! Standard keyboard and mouse should work well out of box. 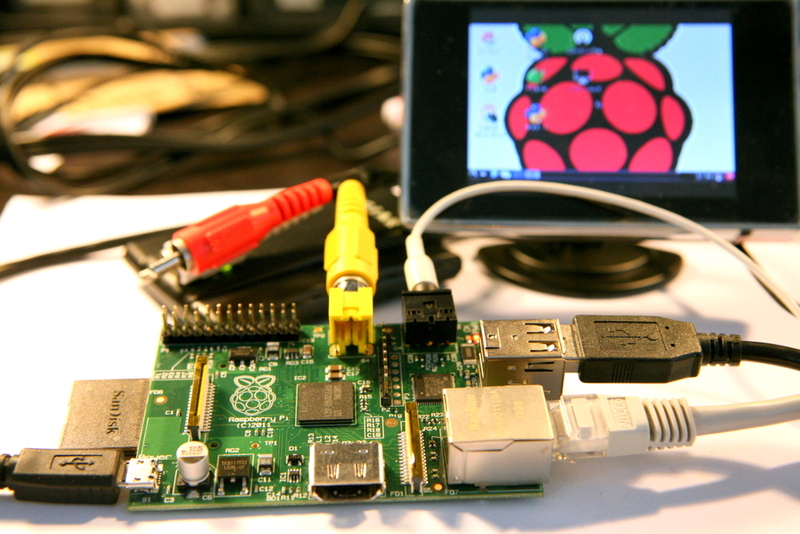 This version (model B) of Raspi has two built-in USB ports. Of course you can use an USB hub to extend the ports. It doesn’t have a WiFi chip on board but it does have a Ethernet jack. I plugged in a NetGear WNCE2001 WiFi adapter and instantly I have WiFi connection. It also works with a variety of USB WiFi dongles, so it’s really convenient. One of the biggest selling points of Raspi is of course its price: this model B is just $35 before tax and shipping (keep in mind that even an Arduino board, which has a must simpler microcontroller, would cost almost $30). This is totally impressive, especially considering we have to factor in reseller margins on top of the manufacturing cost. I don’t what’s the profit margin, but perhaps it is consistent with a recent article that discusses how you can’t make money any more on hardware, instead, it’s the software and service that keep consumers to buy in. Anyways, I am glad I finally got one. There is a lot of stuff I am excited to experiment with using Raspi, and I am sure I will come up with some itneresting project ideas along the way. A thumb up for Raspi!